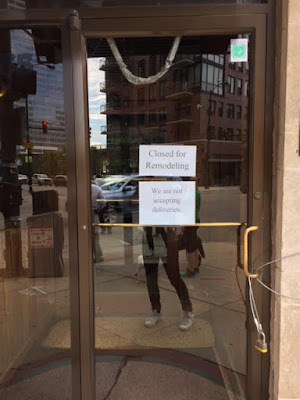 Sloopin - A South Loop Blog: Blackie's (Polk/Clark) Closes - New Deli Spot Taking Over? Blackie's (Polk/Clark) Closes - New Deli Spot Taking Over? Blackies on Polk and Clark has been sold and is currently closed for remodeling. The new owners are the owners of Jefferson Tap in river north. They are planning a Jewish style food and deli\restaurant. Though Blackies had solid consistent food, it seems they couldn't keep up with the changing neighborhood. It appears Blackies on Clark st has closed! I walked by there and they appeared to be having a goodbye meeting to all the staff there. I overheard someone saying there's a change of ownership and it looks like something new is going in there. Very sad to see since it's been a staple of a restaurant for several decades and in my neighborhood! In our opinion, it's probably good to see some evolution here. While Blackies was fine, it seemed to get overshadowed by the other options popping up in the Sloop. We'll be curious to see if it's true about the deli concept. Is there room for Manny's, Eleven City Diner and another deli spot? Maybe we will see.